In this first installment of The Truth Will Set You Free podcast, Vic Batista of Miami’s Calvary Chapel Broward and Nathan Jones of Lamb & Lion Ministries will teach on the Rapture Road, a verse-by-verse study covering the biblical prophetic book of 1 Thessalonians. Nathan Jones: We thank the Lord Jesus Christ that you could join us in this opportunity to study God’s prophetic Word. We’re asking the Lord to reveal to us what He wants us to know and to bless all who read His Word so that we may all grow in our relationship with our Savior. Vic Batista: We often tackle the subject of Bible prophecy by subject, but in this teaching series, we’re going to address prophecy by going verse-by-verse through 1 Thessalonians. I am excited that we’re diving into 1 Thessalonians because it’s an incredible book that when studied can dramatically change your perspective about God’s plan for your life. Touching on the book’s background, we find the Apostle Paul around 50 AD entered the city of Thessalonica while traveling along his second missionary journey. He stopped to preach there for only three weeks, and in that short time, he was still able to establish a church. After Paul moved on, he sent two letters back to the Thessalonians to continue to give them more teaching and guidance and to provide them with the hope-filled message of Jesus Christ’s return. 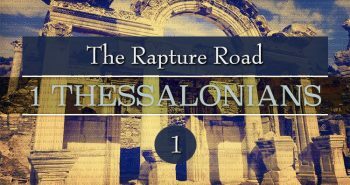 That’s why we’re going to call our topic “The Rapture Road” because the subject of the Rapture is the center prophetic message of 1 Thessalonians. Sometimes people think that Bible prophecy is too difficult for the reader to understand, especially when it comes to the subject of the Rapture, but that’s not the case, right? Nathan Jones: Not at all! 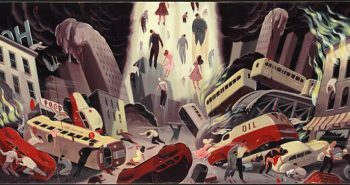 The subject of the Rapture gets a lot of bad hype, but when you take a plain sense interpretation of the supporting texts, it’s not really a difficult subject within the doctrine of Eschatology to grasp. When it comes to the amount of time Paul spent in the city of Thessalonica, the three weeks is debatable. Some theologians think that Paul was there just three weeks, and a few others believe he was there a few months. The reason for considering a longer stay is because Paul was able to set up his tent making shop and sell tents to cover his missions expenditures, and doing so would take some time. Regardless of how long Paul stayed there, what we do know for sure is that Paul did write two letters to the new church he established in that city. These letters are some of his earliest, actually his second earliest ones to be specific, and he wrote them from another city in Asia Minor called Corinth. Why was Paul’s visit so brief? Because he was driven out of town, as he occasionally was. Paul believed in ministering in the synagogues first, as to the Jew first and then to the Gentiles. The Gentile world in which Paul’s journeys took him went through an area called Macedonia, which borders present-day Greece and Turkey. Paul found many Jewish people had been exiled there after the Assyrian and Babylonian exiles, and stayed instead of returning to the Holy Land. Wherever the Jewish people settled, they founded synagogues. As a fellow Jew, Paul would enter into those synagogues and begin sharing the Gospel. If the Jews accepted the Gospel, great! A new church began. If they did not accept the Gospel, Paul went next door and began to witness to the Gentiles. Unfortunately, in the town of Thessalonica, the Jewish people did not take too kindly to Paul’s message. They rose up in an angry mob and raided the home of a man named Jason, with whom Paul had been staying. The mob dragged the Apostle to the magistrate and there they accused Paul of attempting to incite a riot against the Roman governing authority. The town of Thessalonica shared a special political relationship with Rome that allowed Thessalonica some semblance of self-government. The town had helped Caesar Augustus over his challengers, Cassius and Brutus, for caesarship. Their self-rule position hung very tenuously, and the town’s leaders worried that if anything happened that even smelled of insurrection to Rome that their special self-rule status would be thrown out. The mob knew just how to make their false accusations against Paul that would work on their town’s greatest fear. Paul got a really raw deal there because of how the mob used this very wary political position. By accusing Paul of trying to incite Thessalonica against Rome, the town’s leaders had no choice but to force Paul out. Fortunately, the town magistrates saw through what the Jewish people were trying to do. He knew their accusations were false. Instead of having Paul imprisoned or killed, they just told Jason to send Paul and his friends on their way. And, so they did. Paul wrote this letter from Corinth looking back at the town of Thessalonica and all the troubles and rejection he had to endure for the sake of the Gospel. Vic Batista: We can also look over in Acts 17 to get some more background behind 1 Thessalonians. Nathan Jones: Yes, Acts gives the travel log, so to speak, of the Apostle Paul’s missionary journeys. We learn that Thessalonica was a really interesting city. It had a long history that I would love to get into more as we continue our study. In the second part of our travels along the Rapture Road and our verse-by-verse study of 1 Thessalonians, we’ll begin at the very beginning with Paul’s greeting to his newfound church. Someone recently told me the 3rd Temple has to be finished? Is this correct? Before the Rapture? No, nothing has to happen before that event. Likely the effect the Rapture will have on the world will kick off the chain of events that will lead to the building of the Third Temple. Isn’t the Rapture preceded by or accompanied with the darkening of the sun and the moon turns red? And massive earthquake? Those signs proceed Christ’s Second Coming at the end of the Tribulation, 7+ years after the Rapture. For a short Inbox video listing the differences between the two events, check out http://christinprophecy.org/sermons/the-inbox-20-is-the-rapture-and-second-coming-the-same-event/.